Today, there are more than a billion people living without access to clean drinking water and that's really hard for us imagine on the east coast of the United States, where there is water everywhere. Today, I'm standing in a stream near Lemont, Pennsylvania. And if I were here a hundred years ago, I would have readily taken a sample of this water and drunk it. But I’m not quite so sure about that today. There are factories around, there's farms around, and this water is probably not quite good enough to drink. This stream behind me is a tributary to the Chesapeake, and ultimately this water ends up in Chesapeake Bay, and if I can't drink this water here in rural Pennsylvania, can you imagine what it's like by the time this water gets to the Chesapeake? It would definitely be a bad decision to drink the water flowing into the Chesapeake Bay today. The other part about being on the east coast of the United States is we're in a lush region, and climate change here is forecasted to make this region maybe a little bit more lush and a little bit higher rainfall in the future. We'll never have a problem with access to drinking water in this part of the world. But if we go out to the western part of the U.S., climate change forecasts predict that the region will become a lot drier, and communities out west in the U.S. are going to have to make really tough decisions as to how they manage their water resources. Such tough decisions have already been made in places around the world such as Australia, where devastating droughts over the last two decades have led rivers to virtually reverse course, and communities have had to make very tough decisions about how they manage their water resources. So, in this module, we'll learn a lot about how water behaves on the surface of the planet, what is going to happen in the future with climate change, and the choices communities are going to face with dwindling water resources. Now, enjoy it and please get started. There is a new generation of super-rich, highly influential people who are starting to invest massive amounts of money and influence in truly important causes. Bill and Melinda Gates in global health, Warren Buffett in reproductive health and food, the Jolie-Pitts in community development and the Katrina recovery effort. Now, enter Matt Damon and Gary White who have co-founded water.org, an organization dedicated to developing and delivering solutions to the global water crisis. Visit water.org  and you will find an impressive array of information and programs. Here are direct facts from that site which convey the magnitude of the current global water emergency. Because groundwater systems recover very slowly from human impacts, remediation can be extremely difficult and expensive. In this module, we begin by examining the distribution and behavior of water close to the Earth’s surface; next, we consider how climate change will alter the supply of water and how population growth will change the demand; finally, we present management strategies that will hopefully preserve the supply of water for humans around the globe. Ancient civilizations developed in some of the driest realms of the planet. Populations in Egypt and Mesopotamia (an area that includes parts of modern Iran, Iraq, Syria, and Turkey) learned how to survive in an arid environment. 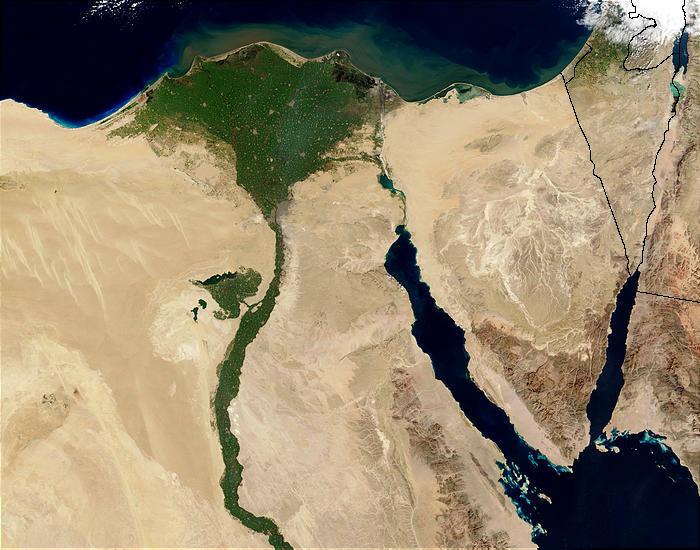 For example, ancient Egyptians and Mesopotamians constructed an extensive network of canals to transport water away from the Nile River for irrigation. 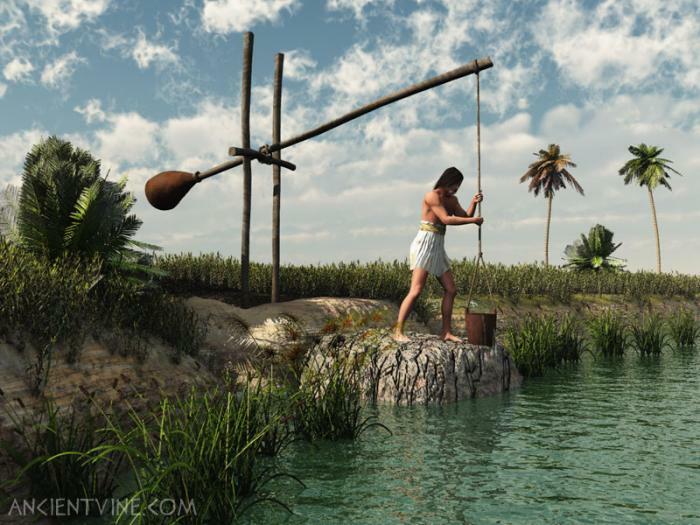 Shadufs, which are contraptions consisting of buckets at the end of a boom which could be lowered with a rope, were used to haul water out of the canals and onto the fields. These civilizations routinely had to live with highly irregular precipitation consisting of periods when large amounts of rainfall flowed through the canals and flooded large areas, alternating with times of almost no rainfall. As the population has increased, and especially with the rise of industry in developed nations, so has demand for water soared. Moreover, industry has increased competition often for the cleanest drinking water supplies. Nowhere has the interplay between the increasing demand and limited supply of water been more complicated than in the desert southwest of the US. The city of Los Angeles receives a meager 38 cm (15 in) of rain a year. Yet, the city has the highest water usage in California and some of the highest use rates in the country. You would never know by looking at the number of golf courses and car washes and the abundance of lush, green lawns that the city is located in a desert. The same is true for Las Vegas, which receives significantly lower rainfall. Los Angeles uses much more water than it receives from precipitation and, thus, it imports water from the northern part of California and from states to the east via the Colorado River. 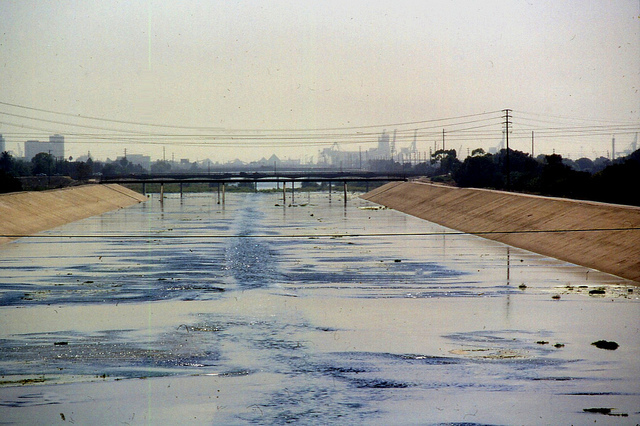 In fact, much of the development of Los Angeles was fueled by this supply of water from the Owens Valley in the Sierra Nevada and the Colorado River to the east. 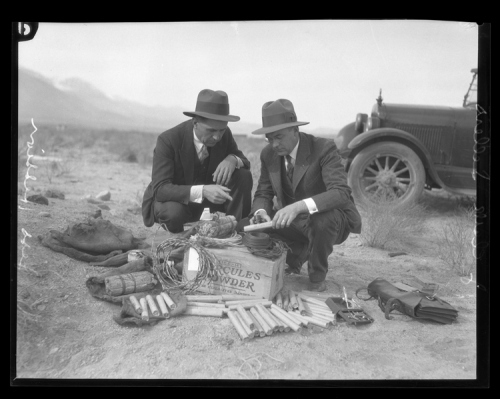 Water from the Colorado River began to flow into Los Angeles in the 1920s and 1930s and included the construction of Parker Dam and the Colorado River Aqueduct. The growth of other cities that lie in arid locations closer to the Colorado River, including Denver and Phoenix, will likely lead to bitter litigation over water rights in the southwest in coming decades. Overseas, countries in arid parts of the globe, for example, Turkey, Iraq, and Syria, have also had major disputes about water rights and management. Turkey, which lies at the source of the Tigris and Euphrates rivers, has constructed dams on both rivers for irrigation purposes as well as for hydroelectricity, and this has led to long conflicts with countries downriver including Syria and Iraq. With projections for increasingly rapid growth of world population and coupled demand for water for drinking and agriculture, as well as for industry, maintaining a clean water supply looks to be one of the grand challenges of the 21st century. The goals of this module are to learn about how water is cycled on the Earth’s surface and how climate change coupled with the growth of population will accentuate the global water crisis. propose strategies to cope with an increasingly thirsty planet. The distribution of water on the Earth’s surface is extremely uneven. Only 3% of water on the surface is fresh; the remaining 97% resides in the ocean. Of freshwater, 69% resides in glaciers, 30% underground, and less than 1% is located in lakes, rivers, and swamps. Looked at another way, only one percent of the water on the Earth’s surface is usable by humans, and 99% of the usable quantity is situated underground. All one needs to do is study rainfall maps to appreciate how uneven the distribution of water really is. The white areas on the map below had annual rainfall under 400 mm for the last year, which makes them semi-arid or arid. And, remember, projections are for significant aridification to occur in many dry regions and for more severe rainfall events to characterize wet regions. The following video provides a schematic summary of the water cycle. Video: The Water Cycle (1:23) This video is not narrated. The hydrologic cycle describes the large-scale movement of water between reservoirs including the ocean, rivers and lakes, the atmosphere, ice sheets, and underground storage or groundwater. 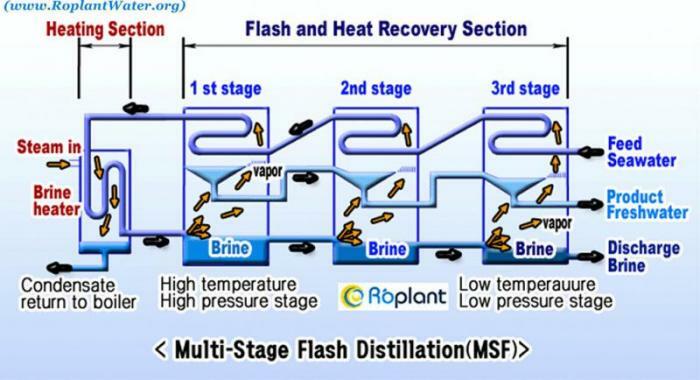 Schematic of the hydrologic cycle. Water evaporates from bodies of water such as the ocean and lakes to form clouds. The moisture in clouds ultimately falls as rain or snow, some of which returns back to the ocean, lakes, and rivers. The remainder percolates into the soil where it reacts with organic material and minerals and ultimately moves downwards to form groundwater. The amount that percolates depends strongly on evaporation as well as soil moisture, as shown in the video below. Video: NASA Land Globe Animation (1:00) This video is not narrated. Freshwater used for drinking, agriculture, and industry derives dominantly from rivers, lakes, and groundwater, with the latter reservoir accounting for approximately 20 percent of freshwater on the earth’s surface by % of potable (i.e., safe drinking) water. In the US, 86% of households derive water from public suppliers, and 14% supply their own water from wells. Nevertheless, households utilize only one percent of water extracted, the remaining 99% of water is supplied to industry (4%), agriculture (37% compared to 69% worldwide), and thermoelectric power plants (41%). Water use in most areas of the US has increased substantially over the last century. In this lab, we will observe the impact of precipitation in stream flow and flooding. The practice and graded sequence of steps are identical. Please go through the following sequence of questions for the practice, check your answers in the Practice Lab in Canvas, then go to Canvas to take the Graded Lab when ready. The US Geological Survey maintains the water watch website, which shows the current state of stream flow, drought, flood and past flow and runoff. We will focus on stream flow data, and you will be required to summarize national trends. The data are expressed as percentiles over normal stream flow for the date of interest. The site has an animation builder  that allows you to observe changes in stream flow over short periods and intervals back to 1999. The animations show both regular stream flow and flood stage locations. 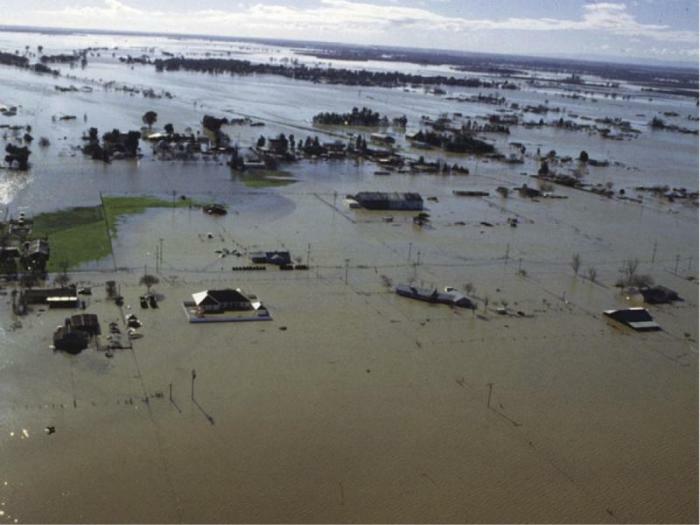 Between 1st July and 31st August 2010 — which region of the US experienced the most flooding? Use the map below of regions in the US to help you answer this question. Note this is the first part of a two-part question. When do the major floods occur between 1st July and 31st August 2010? Note this is the second part of a two-part question. This will show you precipitation anomalies relative to the monthly mean for the 1950-2000 period, in millimeters per month. Then review the months of June, July, and August, comparing these images with the flood occurrences. During June, July and August 2010, the increase in flooding coincided with ________________? How does the timing and location of August 2011 flooding relate to hurricane activity in the Atlantic? (Hint: Do a Google search for 2011 Atlantic hurricane season). The peak flooding in August 2011 coincides with the landfall of which hurricane? Where are the major floods in early December 2010? Are the December 2010 floods in the eastern portion of the country more likely related to a prolonged period of high precipitation, a hurricane, or a brief, strong storm system moving through the area? What is the relationship between the December 2010 floods in the western part of the country to ENSO? December of 2010 was during a La Niña event. Go to the National Weather Service Climate Prediction Center  to see what the typical pattern of precipitation is for the US during a La Niña event. If you run your cursor along the column of letters on the left side, you can see the maps of precipitation anomalies for 3-month periods, so you could look at the maps for NDJ (November, December, January) and see what the typical precipitation anomaly is. For more explanation of these maps, click on the link in the upper right of the window that says "Information on Data, Methods, and Interpretation." December 2010 was a La Niña year. During a La Niña year, the southern US experiences _______precipitation and the northern US experiences ______precipitation. In the second part of the lab, in Google Earth, we will observe discharge (in cubic feet per second) for various points along the Mississippi during the devastating floods of 2011. Stream gages are planted in the middle of the river, and the gage measures the volume of water passing through a known volume during a known time. The units are in cubic feet per second. Roughly when is peak discharge at Winona Minnesota (give your answer in month date format (e.g., November 05 for November 5th). Roughly when is peak discharge at St Louis Missouri (give your answer in month date format (e.g., November 05 for November 5th). What is the peak discharge (in cubic feet per second) at Winona? (to nearest 50,000 cubic feet per second). Just give a number. What is the peak discharge (in cubic feet per second) at St Louis (to nearest 50,000 cubic feet per second)? Just give a number. Generally is stream flow increasing up or down river? Because of the significance of this groundwater for human use, we consider the behavior of water underground in some detail here. It might seem complex at first, but water flow follows very simple laws of physics. Water at the surface of the Earth seeps slowly into the soil, a process known as percolation. Water will percolate through the uppermost layer of soil and loose material that contains air, the aerated zone, down to a level called the water table. The water table is at the top of the permanently waterlogged or saturated level. Schematic diagram of the water table, saturated and unsaturated zones. The water table is a critical level because it defines the top of the aquifer, the body of water that can supply drinking water. The flow of water underground is controlled by a number of factors including the permeability of the aquifer and the hydraulic gradient. Explained simply, the hydraulic gradient between two wells is the difference in hydraulic pressure (known as hydraulic head) divided by the distance between them. If the difference in hydraulic head is high, water will flow readily; if the difference is nil, then water will only flow if pumped. The hydraulic gradient at points at the top of the water table is generally level. Schematic diagram showing the relationship between porosity and permeability. The permeability of a rock is a function of a number of factors that include the amount of pore space, the arrangement of pores, and the amount of surface tension from grains, especially tiny (micron-sized) clay minerals that have very high surface area. The larger the pore space, the more connected the grains and the less clay, the higher the permeability, and the more easily water flows. Conversely, where pore space is tight and poorly connected, and there is a lot of clay, permeability is low and water cannot flow readily. The best aquifers are often made of rocks with both high porosity and high permeability such as sandstone, but rocks with generally lower porosity can also be highly permeable. For example, limestone is often jointed and is readily dissolved by groundwater, leaving the rock highly permeable; rocks such as granite and basalt are often heavily fractured allowing water to flow readily. Some of the most productive aquifers are called “contained” or “confined,” and are sandwiched between low-permeability layers called “aquicludes.” Common aquicludes are shale and mudstone layers. Such contained aquifers can have a high hydraulic gradient because the aquicludes hold a significant hydraulic head; confined aquifers often produce wells called artesian wells that, owing to substantial confining pressure, produce water without pumping. Schematic diagram showing confined and unconfined aquifers and the flow of water into wells. In other cases, the tops of aquifers are not confined by an impermeable layer. Such aquifers are called unconfined and will, all other things being equal, be characterized by less confining pressure. Groundwater is continuously exchanging with other reservoirs in the hydrological cycle. Aquifers are recharged with water from rain and snow percolating through the aerated zone. Conversely, groundwater flows back into rivers and lakes or into wells and springs in a process known as discharge. The time water spends underground is called the residence time, which varies from a few days to 10,000 years or more. As we will see later, the water table can move downward as a result of drought and this is happening in arid areas today. Like any layer in the subsurface, aquifers, and aquitards structurally support the overlying strata, and in turn, the ground level. If an aquifer is excessively pumped, water is drawn in from the surrounding aquitards. In cases where the aquitards are soft and unconsolidated, for example, composed of clays and silts, overpumping can cause these layers to fail structurally, expel much of their water, and literally collapse. When this happens, the overlying ground level can be lowered as a consequence, a process known as subsidence. In the case of arid regions where aquifers are naturally recharged at very slow rates and where they are pumped intensively, significant subsidence can result. Some of the most drastic and best-known subsidence resulting from overuse of aquifers occurs in the San Joaquin and Sacramento Valleys of California, where the land level has subsided up to 10 meters in the last 90 years. The San Joaquin and Sacramento rivers flow together in an area called the Sacramento-San Joaquin River Delta, an inland version of the Mississippi Delta where a series of tributary channels meander over a low-lying, flat plain. The area is an inland estuary with the Pacific Ocean on its western edge. The Delta area, as it is known, is some of the most productive farmland in the nation and provides 70% of the water supply of northern California. 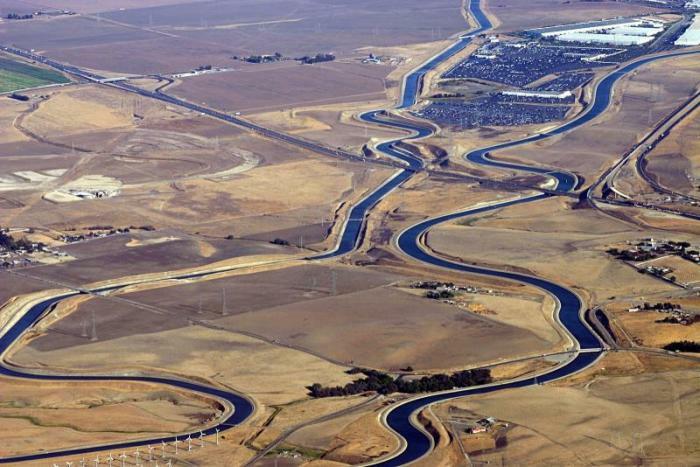 The water in the Delta channels has been controlled by human-made earthen levees to prevent flooding of low-lying agricultural areas as well as large developed areas including parts of the cities of Tracy, Stockton, and Sacramento. The 2600 mile long levee system has been built over more than 100 years and is beginning to suffer from the test of time. Subsidence has occurred as a result of oxidation of organic material in soils and compaction from farming, and the structures have been weakened by erosion and seepage. Areas behind the levees have subsided by up to 25 feet, placing further strain on the structures. Failure of levees has already occurred over 30 times in the last three decades, leading to substantial flooding, massive evacuation and six fatalities in Marysville in 1997. Levees in the delta are maintained by the Army Corps of Engineers to withhold the strain of a 100-year flood. However, increased precipitation as a result of climate change has led some to question the Corps’ definition of the 100-year flood, and the same critics warn of catastrophic levee collapse, which could lead to massive numbers of fatalities and enormous property damage. Ultimately, what is required is significant investment in fortifying levees to prevent this from happening. 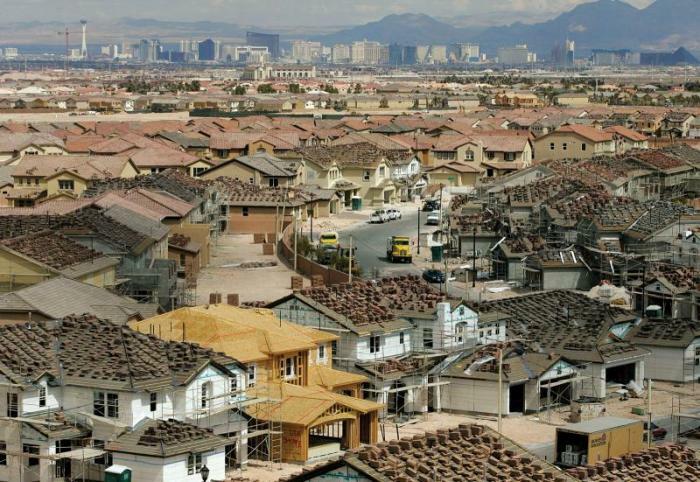 Subsidence as a result of overpumping is actually a relatively common problem, especially in areas with rapid population growth, for example around Las Vegas, which until recently was the most rapidly growing city in the US. 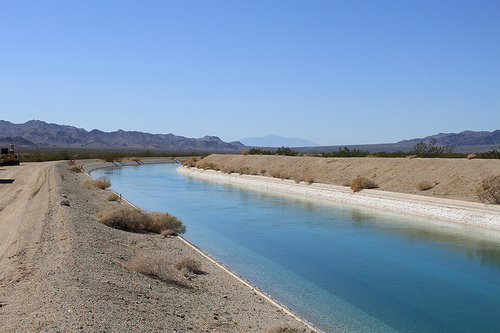 In Las Vegas, water use has exceeded recharge for many decades, leading to structurally controlled subsidence of up to 2 meters along pre-existing geological faults. Subsidence of some 3 meters has also occurred in the area around Houston as a result of population growth combined with extraction of large amounts of oil and gas from the subsurface. Harbour Town Golf, Hilton Head, South Carolina. As we will study in detail in Module 10, significant subsidence in the Mississippi Delta region around New Orleans has resulted partially as a result of over-pumping. Even along the east coast of the US in the Carolinas, subsidence, although not as severe as out west and along the Gulf Coast, has resulted from over pumping for agriculture and industry. In fact, one of the major demands on water in the Carolinas is for golf courses (see the lush grass in the photograph above), which account for about 60% of irrigation usage in some areas. Without major changes in water usage and conservation, subsidence will continue and even accelerate into the foreseeable future. Overuse of groundwater does not have to lead to major land subsidence before it causes problems. On a more local scale, over-pumping can result in lowering of the water table in a process called “cone of depression,” a generally concentric pattern of water table drawdown. Such over-pumping often results from industry or agriculture but individual landowners often feel the repercussions. Contamination of groundwater supply can occur as a result of natural processes as well as industry and agriculture. Probably, the most lethal and extensive groundwater pollution problem globally is actually natural in origin: the contamination of groundwater with high concentrations of arsenic. 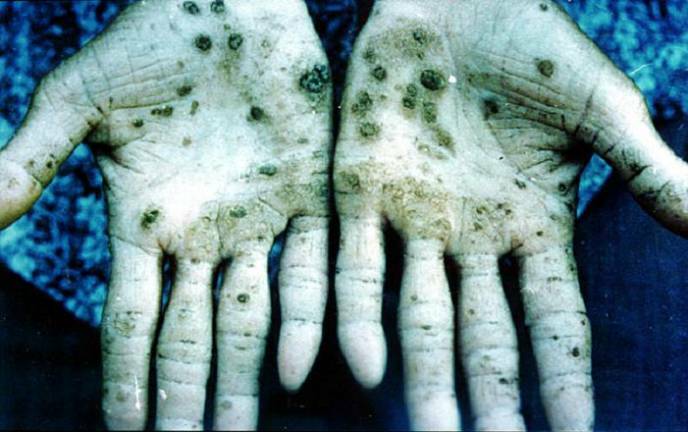 Approximately 100 million people globally are exposed to high levels of arsenic in groundwater. Nowhere is the problem more devastating than over large regions of Bangladesh and the West Bengal region of India, where millions have been poisoned by arsenic. This area is intensively irrigated, which has changed the flow of groundwater over a large region. As a result, a shallow aquifer is the source of groundwater for 35-77 million inhabitants who obtain their water from shallow tube wells. Click here to see full-size versions and complete source information. High levels of arsenic in this water likely derive from microbial activity that dissociates arsenic from organic material. Arsenic is highly poisonous and carcinogenic and long-term exposure to it can lead to high incidences of skin lesions, bladder, lung, skin and kidney cancer, respiratory disease, and liver and kidney disease. Because the threatened regions are heavily populated, this pollution has made millions of people sick and caused thousands of deaths each year. Even though the hydrology of the affected areas is not well understood, the solution to the arsenic contamination issue involves a combination of extensive monitoring, closing down high-concentration wells, distribution of filters and chemicals to remove arsenic from drinking water, and ultimately tapping deeper aquifers. 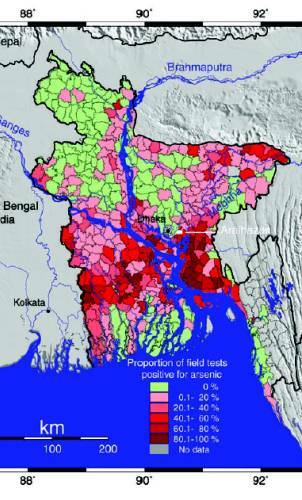 The following video provides an overview of the arsenic problem in Bangladesh. Announcer: From United Nations television: This is UN In Action. Narrator: Bangladesh awash with an abundance of water. Monsoon rains blanket the country during the wet season. All over the countryside, thousands of shallow wells have been dug using this traditional technique.These wells offer life during the long, dry season: water to drink, water to clean, water to live. 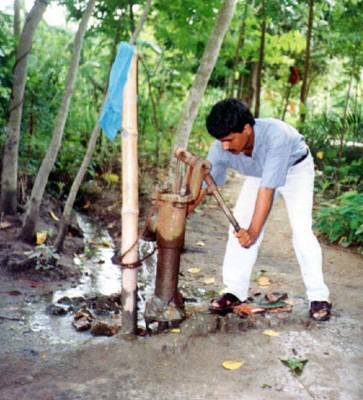 But in early 1990s, dangerous levels of arsenic water were detected in these shallow wells. Suddenly, an unseen poison threatened Bangladesh's water supply. The crisis has led to a long and arduous search for safe water in the country over the past 20 years. Dr. M. Khaliquzzaman from the World Bank. Dr. M. Khaliquzzaman: The arsenic issue was identified in the early 90s in Bangladesh, and roughly about 35% of the whole country is now infested with this problem. The amount of people involved is more than 50 million. So, this is a huge, huge problem. Narrator: Almost overnight, one of the country's bountiful blessings became a deadly curse. Yan Zheng from UNICEF. Yan Zheng: Arsenic is very interesting because interacts with cells the genes in many, many different ways. So, it is a toxin. It's probably one of the only environmental toxins that attacks more than one organ in human body. And it also causes various gene mutation or expression differences that other environmental carcinogens just incapable of doing. Narrator: This villager has dealt with the effects of arsenicosis for over 20 years. Arsenic can create painful lesions on the skin and cause various cancers. Villager (translation): It was hurting so much, I wanted to cut it out. Narrator: As part of the arsenic mitigation efforts,, the International Atomic Energy Agency (IAEA), in collaboration with the Bangladesh Atomic Energy Commission, has used nuclear techniques since 1999 to help locate safe water. Called isotope hydrology, they discovered that arsenic occurred naturally in the groundwater. By analyzing the age of groundwater and tracking its movement, they have helped predict where safe water can be found. Once the cause was discovered, villages were discouraged from digging shallow wells. Water from this well might be used to clean clothes but will not be safe for drinking or cooking. Nasir Ahmed from the Bangladesh Atomic Energy Commission. Nasir Ahmed: This shallow aquifers is highly contaminated. The deep aquifer is one of the solutions for providing the safe and sustainable the water supply to the rural people. Narrator: Working in 12-hour shifts, these men drill deep into the ground to find safe water for a village. It will take a week to reach 700 feet, where water is free from arsenic. In the town of Chapai Nawabganj, the IAEA and World Bank have used isotope analysis to find safe water. The discovery helps Bangladesh to save lives and money and investments needed for arsenic removal and water treatment plans. People now know that the best treatment for arsenic poisoning is drinking safe water, says this villager. Villager (translated): If we get safe water, that's the real medication for us. Water is life. No one can live without safe water. Narrator: Enormous progress has been made in projects like these over the past 20 years. Yet more needs to be done to ensure that clean drinking water in this country would remain arsenic-free long into the future. Human and agricultural sewage is another potential source of pollution. This pollution leads to a variety of different impacts on health all the way from gastrointestinal illness to, in severe cases, cholera, typhoid, amoebiasis, giardiasis, and E. coli. The following video explains the sources of groundwater contamination. Narrator: Do you know where your drinking water comes from? Do you know what happens to all of the chemicals that you use day to day? Things such as cosmetics that wash down the drain? Pharmaceuticals that flush down the toilet? Motor oil running off parking lots, and even paint down a drain? Many of these chemicals eventually make it into the water that flows underground. Dr. Barb Mahler, a scientist at the United States Geological Survey, an adjunct professor at the University of Texas, is studying what happens to chemicals like these after most of us forget about them. Dr. Barb Mahler: Most people don't think about the fact that there's water underground. And what happens is when it rains, some of that water infiltrates into the surface, and some it makes it all the way down to the water table. And that water table isn't static, water actually moves underground. And so, that's why we have water in creeks. Water is flowing underground and discharging into creeks, and then it becomes surface water. In karst aquifers, the water is flowing through spaces that have dissolved out of the rock. And we don't usually think of rock as dissolving. I mean, granite doesn't dissolve. And that's the interesting property that limestone has, is that when it comes into contact with water that's just a little bit acid, like rain water's a little bit acid, soil water is even a little bit more acid, there's a chemical reaction. And the rock, itself, dissolves. Karst aquifers, such as the Edwards Aquifer in Central Texas, can be more vulnerable to contamination. But why is this? Dr. Mahler is studying what happens in aquifers with a class of contaminants known as PAHs. Dr. Mahler: You can kind of imagine, most aquifers you could think of as a big sandbox. And the karst aquifer you'd think of maybe as a block of concrete that you'd cracked and then dissolved out some tubes through it, a system of tubes. And if you were to pour something poisonous, like a pesticide or an herbicide, or some other type of contaminant, on top of those two systems, that it would move really slowly through the sand grain aquifer. And some of it would stick to the sand grains and some of it would get filtered out. Whereas, in the karst aquifer, it would just be funneled, or focused, into those zones of what we call preferential flow, those pipes going through the rocks. So, in karst aquifers there's this very important interaction between what goes on at the surface and what goes on underground, because they're so closely connected. So, really anything that we use at the surface is going to find its way underground, and it's going to find its way underground quickly, and it's going to move through the underground very, very quickly to come out at springs. One category of contaminants are pesticides: insecticides, herbicides, things that we put on our landscaping and our gardens and on golf courses to try and control weeds and try and control pests. Well, those things are, by design, toxic. They're meant to kill things, so they are contaminants. And whenever it rains, they wash off the surface and they go into the groundwater system, and they can move very quickly, sometimes in a matter of hours, from the surface to come out at Barton Springs. Another category of contaminants that we're all familiar with are things like gasoline, gasoline spills and oil spills. Also, leaking from underground gasoline storage tanks. Those can enter karst aquifers very quickly and can cause contamination that can move through the system in pretty much the same concentrations that we find them at the surface, they could come out the springs. Yet a third kind of contaminant is sediment, and contaminants that are associated with sediments. So, there are some contaminants that tend to adhere to sediment. And if the sediment moves through the system, they'll bring those contaminants with them. The reason that you find them in karst is that the openings in the subsurface are large enough for contaminants on sediment to move through and for that sediment to not get filtered out. So, these are contaminants that sorb to solid phases, rather than being dissolved in water, and in karst systems, we can find those as well. A serious problem can result from overuse of groundwater in coastal regions. Here, there is the potential for salt water to flood into the void where aquifers are drained excessively. This process, which is termed saltwater incursion or saltwater intrusion, happens readily because salt water has a higher density than fresh water, hence the pressure under a column of seawater is greater than the pressure under an equivalent volume of fresh water. This results in flow into freshwater aquifers near the coast. Humans and other mammals cannot process large amounts of sodium in water. Ultimately, it leads to renal (kidney) failure. This is why early explorers who became lost at sea were told not to drink seawater. Likewise, salt water kills crops. Schematic showing origin of saltwater intrusion into the Biscayne Aquifer in south Florida. Saltwater incursion can occur in one of three ways, all as a result of over-pumping. The first is large-scale, lateral flow into the coastal aquifer, the second is vertical upward flow, and the third is flow into the aquifer from coastal streams and canals, often forced by tidal movements. Probably the most well-studied example of saltwater intrusion occurs in south Florida, where development combined with highly irregular precipitation patterns have stressed local aquifers. The Biscayne aquifer is the main source of drinking water in the Miami metropolitan area. The aquifer is unconfined, meaning that it is not overlain by aquitards, i.e., it lies at the surface. This renders the Biscayne sensitive to changes in rainfall, evaporation, and over-pumping. Saltwater intrusion occurs as a wedge underneath the surface with a transitional interface with the overlying Biscayne aquifer. Changes in the drainage of the Everglades as a result of development in south Florida. The history of incursion dates back to the 1900s as defined by the first measured increase in salinity (chloride levels) in the Biscayne aquifer. 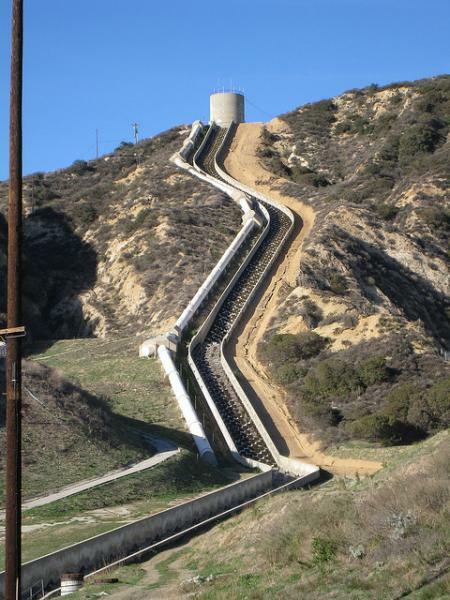 Construction of drainage canals began in 1909 and this resulted in the further inland intrusion of salt water. Intrusion continued unabated until 1946 when salinity-control structures were constructed to prevent inland, tidal movements of salt water. In the 1960s, a large drainage canal system was constructed as part of the massive development of south Florida. Prairie canal developed to divert water in the Everglades. The canals included flow-control structures to prevent excessive drainage from the canal system. However, the design of the structures led to a lowering of freshwater levels in the Biscayne aquifer, leading in turn to increased saltwater intrusion, especially during drought years. Continued movement of the saltwater lens towards the coast and inland has occurred as the new parts of the aquifer have been developed and others tapped less intensively. As in other coastal regions, saltwater intrusion is an ongoing issue that will require constant monitoring as development continues and demand on aquifers increases. The potential of saltwater intrusion is one issue behind the development of desalinization technology in arid regions. Sea level rise will increase salinization of coastal aquifers, especially in areas that are dry or subject to seasonal rainfall variability. As we have seen, climate change will alter precipitation patterns on a global scale, leading to higher rainfall in some areas and significantly lower rainfall in others. Superimposed on this will be changes in evaporation, runoff and soil moisture, which will generally exacerbate droughts in areas where rainfall decreases. Generally speaking, regions that are already dry will not get wetter in the next century, and many will become significantly drier. Predicted change in precipitation by the end of the 21st century as a result of climate change. In more detail, recently observed trends of decreasing precipitation over latitudes 30°N to 10°S are projected to continue. Thus arid and semi-arid regions in the south-central US, southern Africa, and the Mediterranean are expected to experience decreasing water supply. In some of these regions water availability is projected to decrease 10-30% by 2050. The IPCC estimates that two-thirds of the world population could be living under water stress or water scarcity by 2025. The areas that are expected to suffer some of the worst consequences of changing precipitation are generally some of the least developed and poorest nations with some of the highest rates of population growth. This combination will likely lead to significantly reduced groundwater recharge, declining surface water reservoir levels, increase in the frequency of groundwater pollution, and most critically, to rapid declines in per capita water availability. Increased precipitation intensity, more extreme events, increased runoff, decreased infiltration, increased likelihood of contamination with sewage, fertilizers and farm wastes, less ice and snow storage, and increased droughts even in areas that receive more precipitation all will place burdens on water supplies in the future. Drought could be one of the most serious consequences of climate change from a human and an economic perspective. On a global scale, droughts will likely lead to losses in revenue from agriculture on the scale of billions of dollars, and worse, force the migration of millions of people in arid regions of the world. Not every country can afford to engineer its way out of drought the way that Southern California has done for the last century. As we have already seen, drought has plagued civilization for millennia and humans have learned to adapt to areas where water supplies are not plentiful or regular. However, the critical difference today is explosive population growth that is placing much more pressure on water supplies. Combined with projections that parts of the globe will become significantly drier in coming decades, drought will likely be much more of a serious issue in the future than it has in the past. The following video provides an excellent summary of the global drought problem. It's signs are subtle and slow. The earth dries. Water levels fall. The rains do not come. And the land is gripped by drought. At its most basic, a drought occurs when more water is used than is replenished. It is a balance between supply and demand, with both natural and human factors in play. The weather is constantly in flux. A low pressure system allows moist air to rise, cool, and form rain clouds. A high pressure system traps the air beneath it and banishes the clouds. Droughts form when changing wind patterns cause high pressure systems to last for months, or even years. Aggravating the problem is society's demand for water. 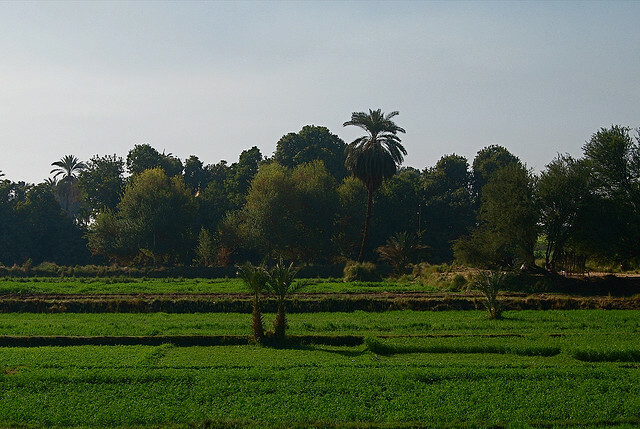 Farms are heavily dependent on water to irrigate crops and provide pasture for livestock. Urban areas also place huge demands on available water supplies. If the demand can't be reduced then the drought begins to take its toll. Crops eventually wither and die. Soil erodes away into clouds of dust. Forest fires spread rapidly. The damage to the environment has large-scale consequences for its human population. Short-term droughts cause stress on both the environment and people. 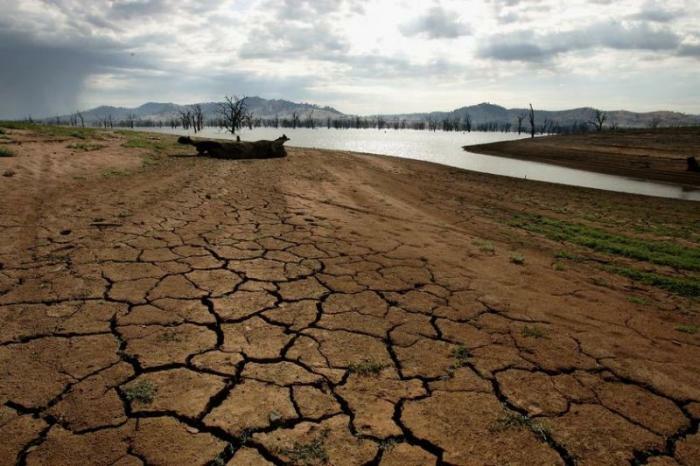 Long-term droughts can lead to war, famine, disease, or mass migrations. In the 1930s, a severe drought in the Great Plains caused massive crop failures. In some places, the drought lasted eight years. So much soil blew away, it became known as the Dust Bowl. 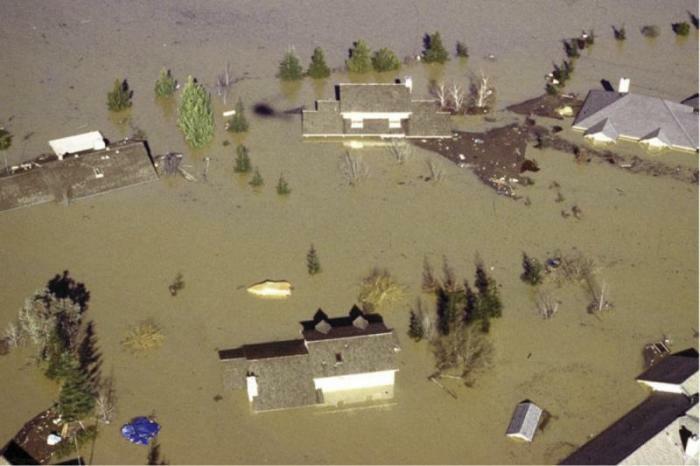 Over 50 million acres of land were affected, forcing many farmers to abandon their own property. But by historical standards, the Dust Bowl was mild and short-lived. Some droughts have lasted for decades. The famines they create have killed over 40 million people in the 20th century alone. Like other forms of weather, droughts are one of the Earth's natural processes. There is very little we can do to stop them. The best we can do is prepare for when droughts do come, before everything blows away. Here, we provide two modern-day case studies of the impacts of drought on water supplies in Australia and China and how these countries are responding to them. 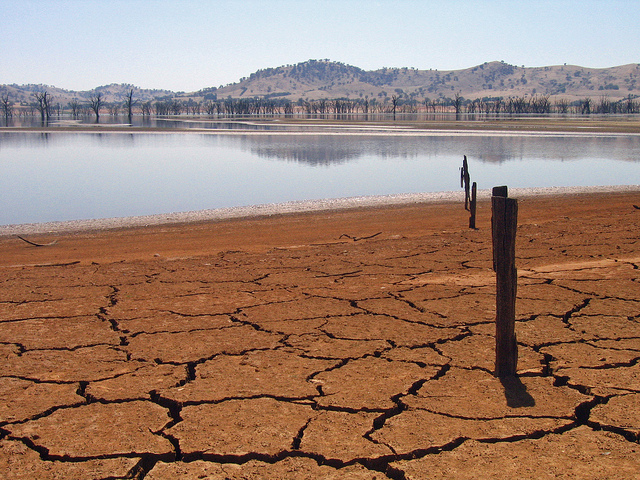 Until 2011, much of Australia was in a decade-long drought, providing a grim picture of what the future possibly holds for the driest continent. The Murray-Darling basin is the most productive agricultural areas in the country, producing a third of Australia’s food. The basin covers over a million square kilometers, about one-seventh of the whole continent, and includes some 20 rivers, most notably the nominate rivers, the Murray and Darling. The region is generally dry (average precipitation is about 500 mm). The total flow of water carried by the Murray and Darling Basin Rivers is significant compared to other Australian rivers, but the amount is dwarfed by the flow of other river systems with equal drainage areas. 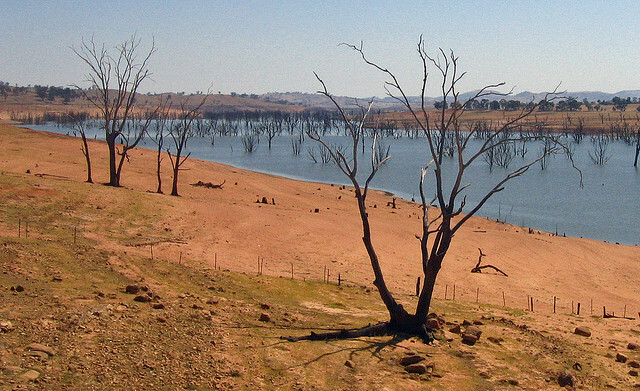 Thus, the region is prone to drought, and there have been numerous times in the past when the Murray, and especially the Darling, have completely dried up. The Murray- Darling basin produces wool, cotton, wheat, sheep, cattle, dairy produce, rice, oil-seed, wine, fruit, and vegetables. And three-quarters of Australia's irrigated crops and pastures are grown in the basin. Thus, the rivers are vital to the Australian livelihood. The following animation shows how Lake Powell has dried up since 1999. Video: Earth 103: Water Level in Lake Powell (00:42) This video is not narrated. Between 2006 and 2009, precipitation in the mountains in the eastern part of the drainage area, which supplies nearly 40% of the water to the rivers, was lower than at any historical time. Other parts of the basin had a total rainfall deficit of about 1.5 meters below normal for the period 1996-2008. Overall warmer temperatures that led to higher evaporation rates exacerbated the impact of the drought. For example, the 1oC warming in the basin area is roughly equivalent to a 10% increase in evaporation. In recent decades, studies have repeatedly confirmed that the environmental health of the Murray-Darling Basin is in decline. On top of the drought, over-extraction of water as a result of past entitlement system has combined with high salinity levels and overall poor water quality, the growth of blue-green algae, declining wildlife, and land degradation to provide a dismal outlook for the basin. Toxic bloom of blue-green algae resulting from nutrient loading in the Murray Darling Basin. 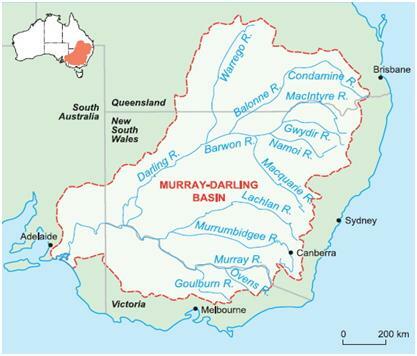 To preserve the water resources of the Murray-Darling, the Australian government has developed a basin plan with a critical provision: an annual water usage (termed a level of take) from the Murray-Darling rivers of 10,873 gigaliters per year (GL/y) that is environmentally and ecologically sustainable for the long term. This take is a cut of about 2750 gigaliters over current levels and will be instituted over a seven-year period. The government is also setting aside some $6 billion to invest in infrastructure, including upgrades to irrigation systems. The plan, which is set to become law in 2012, divides the basin into different surface water (i.e., rivers and lakes) and groundwater areas and sets goals for water usage by agriculture and communities in each of these areas. Moreover, these districts will have the right to trade water with one another. 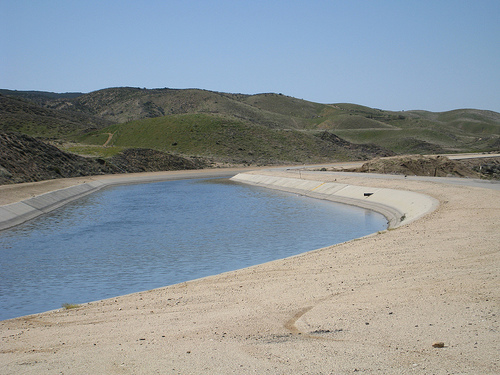 Overall the plan is one of the world’s most forward-thinking water use policies. However, it is turning out to be highly controversial. Environmentalists have charged that the plan is too little, too late, insufficient to ensure continued flow through the basin, and not enough to alter the high salt loads in river waters. Politically, there are also significant issues with some areas targeted for much more drastic reductions in water use than others. However, the policy has the most serious implications for individuals, especially farmers in areas where the most stringent reductions are slated. Enforcement of the water restrictions will almost certainly cause many farmers to go out of business. You can Google “Murray Darling water” for the latest on how this policy plays out. 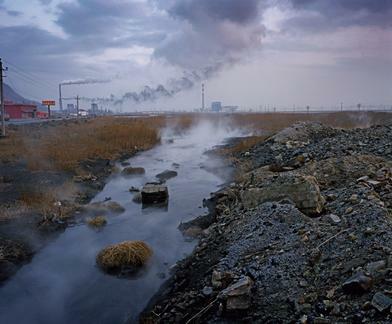 This is summarized in the video Yellow River Drying Up in China . Click to watch it. In areas that are forced to deal with more regular droughts and less regular rainfall, a number of management strategies will become increasingly vital over coming decades. 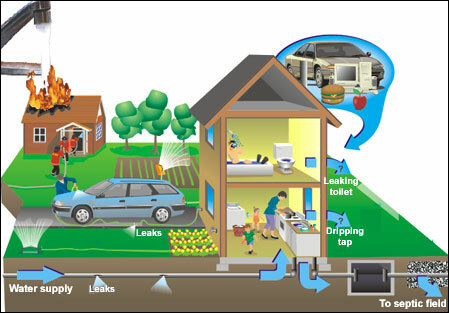 In rural areas especially in underdeveloped countries, potential strategies include techniques already being piloted in many places including rainwater storage, household treatment using filters, planting of drought-tolerant crops and drilling of shallow boreholes or tube wells. As we have already seen, poor and disadvantaged populations in developing nations will bear the brunt of adverse effects of climate change. Yet these nations also have less potential to adapt as a result of limited resources. Thus, developed nations will be under great pressure to help their developing counterparts. 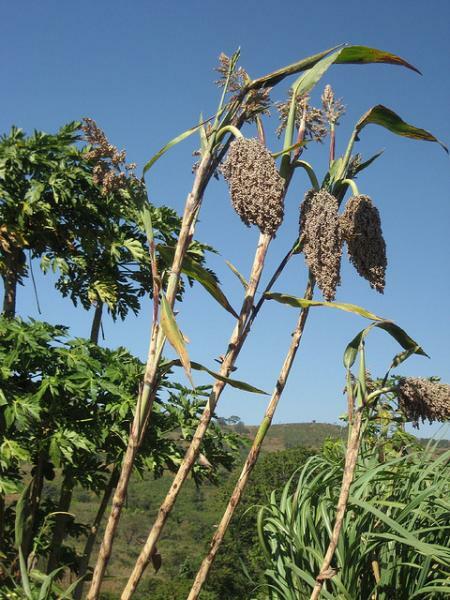 Adaptation will be the most difficult for sub-Saharan Africa. In more developed countries, management strategies include conservation, groundwater recharge, storm-water control and capture, preparation for extreme weather events, diversification of the water supply, and resilience to changes in water quality. PRESENTER: Water. H2O. Dihydrogen monoxide. It's the stuff of life. You may not feel it, but we're in the midst of a water crisis. Really, an impending doom for humans worldwide if we don't do something about it soon. In this video, we're going to talk a little about the problem surrounding water supply today, some new ways to view your water consumption, and how you can contribute towards a sustainable solution to the current water crisis. What better way than to jump right in. So, where is all this water? 97.5% is in the oceans, and the rest of the 2.5% is limited fresh water. Of that fresh water, 70% is locked in the ice caps and snow cover in mountains. About 30% is in groundwater, and just 0.3% is fresh water found in lakes and rivers. Very little is available to us. Of the water that the world uses, about 70% is used for irrigation and agriculture, about 22% for industrial use, and about 8% for domestic use. Rivers don't just transport water, they provide a habitat for plants and animals. And very importantly, they carry silt and nutrients that are vital to the natural process of carrying water from the headlands down to the ocean. They shape and create the land around them, and provide productive wetlands and floodplains where many millions of people farm. Unfortunately, humans have changed these natural processes. We build dams, dump pollutants into waterways, and divert flows to irrigate for crops and provide water for cities. These actions cause serious change in local, regional, and even worldwide environments. Let's start with an example close by in the US, the Colorado River. The Colorado River is 1,450 miles long, bringing water to cities and croplands and generating hydroelectricity for seven states. Virtually all of its water is used up for these purposes before reaching the ocean. All that water is carefully regulated, legally doled out state by state. However, the total water flow has been diminishing due to drought. Dam reservoirs simply hold less water than was expected when they were built. There is serious worry that there isn't enough water for all the people and cities that depend on the Colorado River. Here's another problem, salt is building up. Normal river flow brings salt wash down from the mountains and irrigated lands all the way to the ocean. But now, none of it gets that far. Remember how almost none of the water makes it to the ocean? It's all used up. Greater evaporation at wide irrigated croplands and vast reservoirs where water is spread out at the surface causes the concentration of salt to increase. Increasing levels of salt water poison more and more fields of crops. Here's an example you may have heard about. The Ogallala Aquifer, also known as the High Plains Aquifer, is a shallow, underground storage of water that stretches across portions of eight states in the Great Plains of the US. The Ogallala provides irrigation water for about 30% of the nation's crops. The problem is that this aquifer gets recharged, or rather, water is added, at a very slow rate that takes years and years to come back. We are literally drying up all that water, and we'll virtually never see it again. All around the world, water projects are undertaken to provide water to people and to produce the products we consume, but the side effects are catching up. Rotting vegetation in an artificially flooded reservoir to generate hydroelectricity in the Amazon rainforest actually pollutes more through methane emissions than it would through an equivalent fossil fuel run power plant. Remember how rivers naturally carry silt? Well, sediments are piling up in reservoirs, especially in China, but also elsewhere in the world, effectively rendering dams useless without an easy fix. In many efforts to control water and provide for growing populations, dams are constructed on major rivers. Over time, many dams across China, India, and the rest of the world have failed, spilling over with water, or bursting open with the fury of an entire reservoir of contained water. These are the dams that claim to provide stable flood control and bring peace through irrigation and hydroelectricity. But more often than not, they are met with failure. Even if there is access to water, it doesn't necessarily mean it's safe. In developing countries, about 80% of illnesses are linked to poor water and sanitation conditions. More than one in six people worldwide don't have access to the recommended level of safe fresh water for daily use. As you can see, the water crisis is a real deal. All over the world, humans draw upon and exploit natural resources of water in order to feed, clothe, and provide for a growing population. This exploitation may have provided in the past, but the problems surrounding dams and other water control technologies are unnatural and are just setting us up for major failure. So let's pull things in a little closer and talk about the water you and I use. Of course, we encounter water each and every day. We drink it, shower, wash our hands, flush the toilet, jump in puddles, et cetera. This is the water we see directly. What you might not consider, or have never thought about, is the concept of virtual water. This is the term for the water that is involved in the growing and manufacture of products traded all around the world. 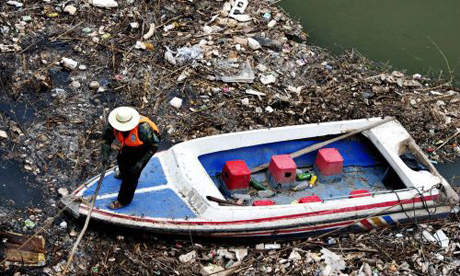 A lot of water is used and polluted from the manufacturing of goods, like T-shirts, cars, plastics, and electronics. It also takes a lot of water to grow corn, wheat, rice, vegetables, and fruits. For instance, water is used in immense amounts, not only to water the plants, but also in the process of creating artificial fertilizers that we depend upon to grow our food. Then there's the water used up in finding, collecting, and processing the fossil fuels used to make these fertilizers and run farm equipment. We use up water to create this artificial energy, which is then used to grow food energy. In the end, it's a large waste of water in order to grow the amount of crops for the population. It takes even more water to grow crops to feed and care for livestock like cows, pigs, and chickens, who eat those crops for you. We could go on and on about the water used to grow the cotton in that T-shirt you might be wearing, the water used to mine the metal and process it into your car, the water used to get the coal to burn and generate electricity. But in the end, water is everything, and our decisions as consumers dictate water use around the world. The products that we buy influence water in geographically diverse areas. That Egyptian scarf that you bought consumed water from the driest areas of Egypt, depriving local people of fresh water because of pollution from textile mills. Food, or other products, imported from around the world influence those local people. In the end, it is not OK to forget about virtual water consumption in Massachusetts just because we live in a wet climate. The products you consume have effects on water systems around the entire globe. Let's look at a typical day. Maybe you spend about 15 minutes in the shower and use 22 gallons of water. Then you brush your teeth, shave, wash your face, whatever else, while the faucet runs, maybe another gallon or two. Over the course of the day, you use six gallons of water by flushing the toilet. Then the dishwasher uses 10 gallons of water. We'll cut it off there, but that's already over 40 gallons. The average American uses 100 gallons of water a day directly. The amount of water that you use indirectly is staggeringly greater, but you can radically change that total by being mindful of the types of things you consume. Let's compare some products and the differences virtual water behind them. One pound of beef takes 1,799 gallons of water to produce. Compare that to one pound of pork, which takes 576 gallons, one pound of chicken, which takes 408 gallons, and 1 pound of goat at 127 gallons. Take a look at some other product comparisons. Some of the biggest decisions you can make to influence your consumption of virtual water is to watch what you consume. Just think about. Think about what you buy. Though you wouldn't immediately think so, everything costs water in some way. If we buy less, there's more money saved and less of a water footprint. Think about what you eat. Try to eat less meat, especially beef and pork. Choose vegetable and grain options that are both healthier for you and reduce your consumption of virtual water. Now, don't get the idea that saving water only matters in considering what you eat and what you consume. Your every day and weekly routines matter, too. While we've talked a lot about virtual water affecting the globe through consumption, there is also direct water use from the faucet. This affects your local and regional water that might just be down the street or across town. Use only full loads of clothes in your washing machine with cold water. Use the dishwasher only when it's full. Pay attention to how long you leave the water on when brushing your teeth or when taking a shower. We use a lot of precious drinking water in all of these situations and it's something we can't afford to waste. Just think. You're not only saving the water used, but also the fossil fuels used to heat the water and the sewage system that has to manage the water afterwards. Drink tap water and don't buy bottles. 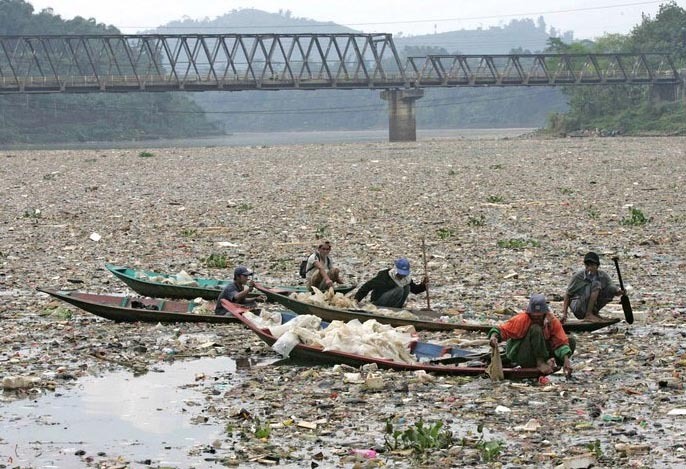 Plastic waste alone is enough of a worry, but it also wastes a lot in burning fossil fuels to make the plastic to transport the bottles and to keep them cold, not to mention that bottles of water are expensive. You're paying 2,900 times the cost of tap water. Educate yourself. Think about where your drinking water comes from. If you're a student at UMass Amherst, your water comes from the Atkins Reservoir, as well as the ground water pumps in the swampy region of South Amherst. Go visit and see what your water source looks like. You'll make a connection with where your water is coming from, see that it's limited, and begin to care about how you treat it. Now you've learned how humans are impacting water around the world and using it up in unsustainable ways. You have the power, as a consumer, to make decisions to limit your consumption of direct water and virtual water, as we strive forward for a sustainable water future. Interested in learning more about the water crisis, virtual water, and what you can do? Check out these websites. It is likely that many or all of these strategies will be required for populations to adapt to declining water resources. One technology, desalinization, has great potential to provide large quantities of water in arid regions, especially those along coastlines. Even in regions where desalinization has the potential to add water and strict management practices are underway, water is such a vital commodity that water rights of communities, cities and even states are often contested in court. Such legal battles sometimes stem from old agreements about the distribution of rivers and groundwater between municipalities that were drawn up before substantial growth occurred. With population growth requiring water for drinking, domestic use, agriculture and industry, the value of water has increased substantially and old agreements are often extremely prohibitive to growth. 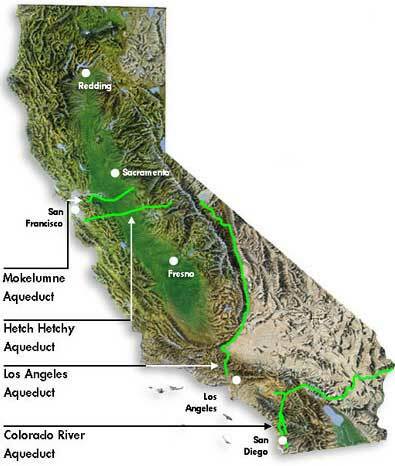 Some of the most bitter water disputes occur in the western US, where, as we have seen, southern California relies heavily on water derived via aqueducts from the Colorado River to the east and the Owens Valley in the Sierra Nevada Mountains to the north. 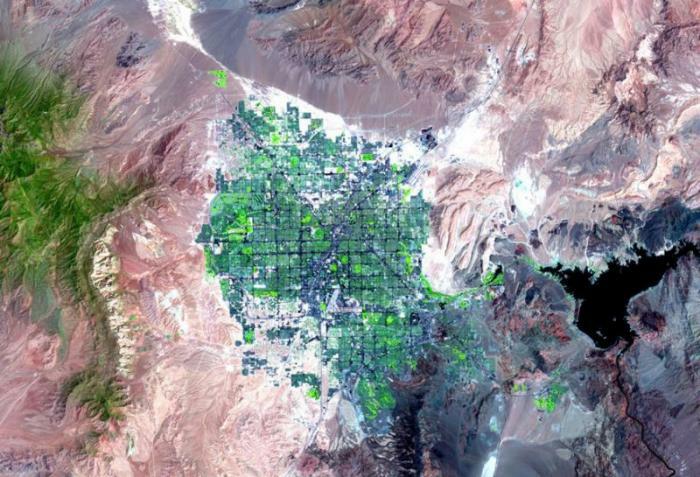 The City of Los Angeles has had brutal showdowns with farmers and environmentalists in the Owens Valley from where it derives about half of its water. The city built the first of two aqueducts from the valley between 1908 and 1913 and the second in 1970. 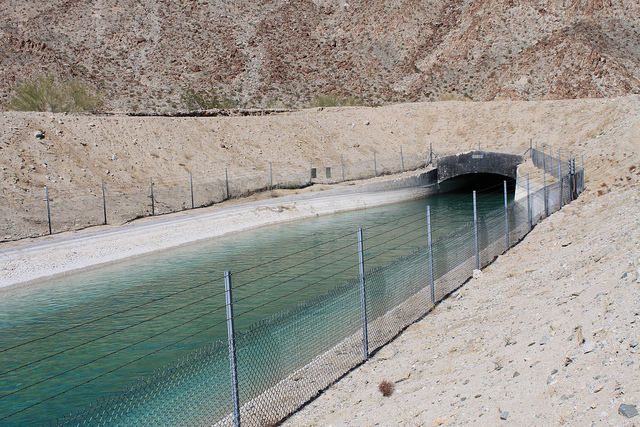 These aqueducts substantially lowered water levels in Mono and Owens Lake and the Owens River and took a terrible toll on farming in the Owens Valley. The impact was so negative that farmers used dynamite to breach the aqueduct and temporarily return the flow to the Owens River. 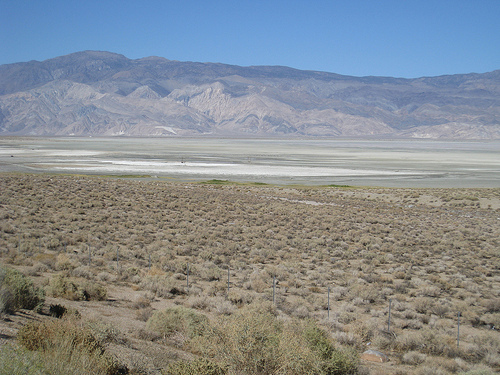 After the second aqueduct was built, a series of litigation began between municipalities in the Owens Valley and ultimately the Sierra Club. The net result has been rulings in favor of the Owens Valley, and some increases in water levels in bodies such as Mono Lake, but ultimately southern California continues to withdraw water at a faster rate than it is being replenished, so the conflict is by no means over. 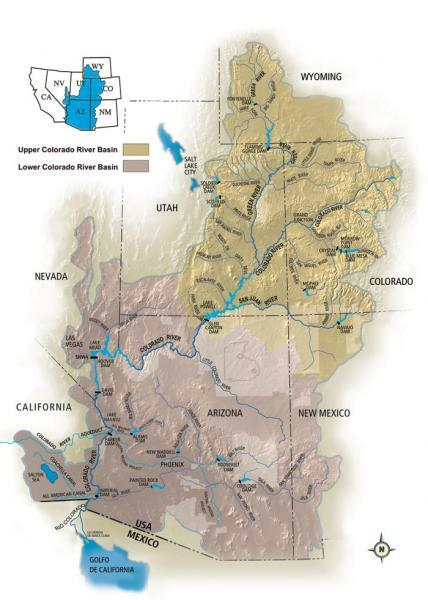 To the east of Los Angeles, water rights for the Colorado River were defined by the Colorado River Compact of 1922, which divided states bordering the river into upper basin states (in the mountains) and lower basin states (in the plains). The compact also appropriated the annual amount of water each group of states could withdraw from the river. 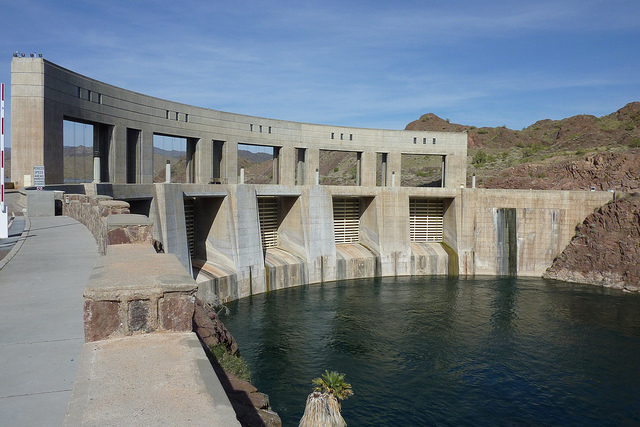 The compact was modified when the Hoover Dam was constructed, at which time the lower basin states (Arizona, California, Nevada) were allocated annual withdrawal amounts. These amounts have led to fierce litigation between Arizona and California, which changed the appropriations in Arizona’s favor. For a long time, only California has completely utilized its quota each year and its surplus was guaranteed by the Secretary of the Interior until 2016. By that time, surging development in Arizona and southern Nevada will require diversion of their quotas from the Colorado and the surplus will no longer be available to California. At some stage, also, upper basin states Colorado and New Mexico may challenge the 1922 Compact to obtain increased quotas of water to fuel growth in these states. At the same time, environmental considerations were not a factor of the original compact. For example, the allocations were not based on estimates of the impact of long-term withdrawal on hydrology and ecosystems. These factors will also likely become significant issues in the future. potential battles over water in the western US and their historical context. Step 3: Using Screencast-o-matic , record your voice reading your vignette. Step 4. Place your video clip at the relevant place in Google Earth by attaching it to a Pin and save as a kmz file (see how to video on the Capstone Introduction  page).